If you think the war on coal in the U.S. is bad, you ain't seen nothing yet! We recently got word that India is set to double the tax on coal production, while promoting electric vehicles and renewable energy projects. I'm pretty sure there's some Luddite reporter in Mumbai right now who's head's about to explode. 1.) India is one of the most polluted countries in the world. And while fuel wood, biomass, and traffic congestion are bigger culprits when it comes to air pollution, certainly reducing coal-fired power isn't going to hurt. 2.) Thanks to India's latest hard-on for renewable energy, we're now presented with even more opportunity to profit from from the inevitable transition of the global energy economy. As it stands now, India plans to add 175 gigawatts of renewable energy generation capacity by 2022. 100 gigawatts of that will come from solar. To put this in perspective, the U.S. currently has less than 18 gigawatts of solar capacity installed. Analysts over Deutsche bank issued a report about a week ago which indicated that by 2022, 25 percent of India's power will come from solar. Analysts also suggested that solar will ultimately become the dominant source of electricity around the globe, generating $5 trillion in revenue over the next 15 years. As we look out over the next 5 years, we believe the industry is set to experience the final piece of cost reduction – customer acquisition costs for distributed generation are set to decline by more than half as customer awareness increases, soft costs come down and more supportive policies are announced. While the outlook for small scale distributed solar generation looks promising, we remain equally optimistic over the prospects of commercial and utility scale solar markets. We believe utility-scale solar demand is set to accelerate in both the US and emerging markets due to a combination of supportive policies and ongoing solar electricity cost reduction. We remain particularly optimistic over growth prospects in China, India, Middle East, South Africa and South America. The biggest solar player in India is Tata Solar Power, which is a subsidiary of Tata Power. 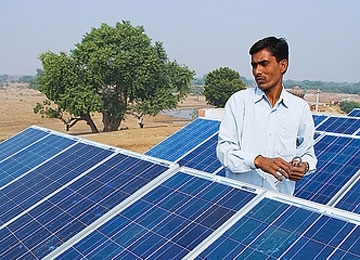 Other solar companies with a solid foothold in India include SunEdison (NYSE: SUNE) and First Solar (NASDAQ: FSLR). Definitely keep a close eye on India throughout the rest of this year as new laws, regulations and incentives kick the Indian solar market into overdrive. Could Apple really buy Tesla for $75 billion? One angel investor predicted it, and his supportive analysis is pretty compelling. Renewable energy is already hot, but Obama just made it hotter.